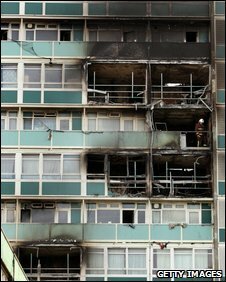 The Fire Brigades Union (FBU) has backed calls for a public inquiry into a tower block blaze that killed six people. Three women and three children, one of them only weeks old, died in the fire at Lakanal House in Camberwell. Southwark Council has also called for an investigation into Friday's fire. The FBU said the inquiry was needed due to increasing public concern about the fire and because of "untrue" stories in the media about how they work. FBU General Secretary Matt Rack said: "Our working lives and training are about saving life and it hurts us deeply when we do not do so. "If there are lessons to be learned then only an open and robust inquiry will identify them. "There is no question that there are serious public concerns about what happened and these need to be addressed properly and the facts established." He added: "No one is ever beyond criticism but some of the allegations being aimed at firefighters are certainly untrue. And some technical and operational issues need to be better explained. A Southwark Council meeting on Wednesday night was told there are 200 blocks in the area with "single-exit enclosed fire escapes", like Lakanal House. Dayana Francisquini, 26, and her children Thais, six, and Filipe, three, were killed on the 11th floor of the building. Helen Udoaka, 34, her three-week-old daughter Michelle, and 31-year-old Catherine Hickman were also killed in the blaze. Labour councillor Ian Wingfield said: "It is imperative that a full and independent public inquiry be held at the earliest possible opportunity... Let's not treat these needless deaths as statistics. "If we are to regain residents' trust we need to open up, not to cover up. We need to take responsibility and show political leadership." Earlier council leader Nick Stanton said a non-repayable grant would be offered to every family that had to move out of the block, with the amount received dependent on individual circumstances. Up to 150 residents have been unable to return to their homes following the blaze. The council said it was looking after 75 families in emergency accommodation and was finalising temporary accommodation for all 98 families affected. Councillors also supported the appointment of Sir Ken Knight, the government's chief fire and rescue adviser, to report on the various investigations into the fire. The design of the block, which has only one central staircase, would be investigated to see how the fire, which is believed to have started on the ninth floor, spread so quickly.